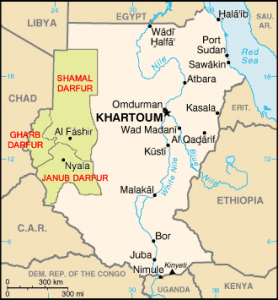 Meanwhile, Sudan agreed earlier this month to end a 21-year civil war in the south between black Christians and Muslim forces from the north. As the Christian Science Monitor reports, both sides of that conflict agreed to a six-year transitional government, after which the southern areas will vote by referendum on whether to secede. But Robert Rotberg, a Harvard scholar on Africa, told the Monitor that agreement might have delayed action on Darfur because the international community “didn’t want to upset the peace apple cart.” Now the Darfur situation is finally being addressed, and Rotberg says it could still result in charges against Sudanese leaders for crimes against humanity.